When is somebody going to realise that this roundabout has been wrongly designed? Mainly the bends at the junction at the roundabout. Even the signs informing drivers of the roundabout are telling us that the road bends to right, when in fact it bends left (approach from M6). I have spoken to hundreds of HGV drivers and other road user and they say that they have never seen a roundabout anywhere in the country like this one. Yes, speed is a factor in this but it’s not the main reason. 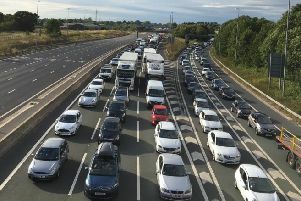 Lancashire Highways says that the relief road on the left side at Sheffalands is to relieve congestion at the roundabout. This extra lane must have cost hundreds of thousands of pounds to construct, with extra removal of spoil, extra drainage, kerbs, Tarmac, etc., not to mention the labour costs. Why not try to reclaim this extra cost from who is responsible for this unused road. With the Highways Department installing permanent cones so that there is no access it looks like it will never be used. The Lancashire County Council’s Highways Department needs to be congratulated for the expeditious way staff carry out inspections of our roads to identify pot holes and other broken surfaces and mark them accordingly, presumably passing the information to a central control point. However, unfortunately in the majority of cases nothing appears to happen and no repairs are carried out (eg Bowerham Road, at the junction with Cambridge Avenue). Eventually the white paint markings are erased by passing traffic and the whole exercise has been a complete waste of time and money. Perhaps a better system could be found? Millions of households in the north-west of England face a hosepipe ban on August 5. The water company United Utilities said seven million customers would be affected. According to UK Water Industry Research, a hosepipe ban can reduce water usage by 5-10pc, which in the North West would amount to more than 100 million litres a day. In their Shale Gas Statement of October 2015, United Utilities stated: “The North West potentially holds vast quantities of shale gas. We have worked with shale gas operators to understand their potential water usage. Assuming that their figure of one per cent is correct, around one fifth of the water we are being asked to save would be used up by the fracking industry if it is allowed to go ahead in this area. Perhaps then we will be a little less willing to do our bit to save our precious water supply. Water authorities are statutory consultees on fracking and, as the water supplier for the region, United Utilities has a legal duty to offer a supply to any legally operating company that asks for it. But some companies, including United Utilities, are actively interested in fracking and have said they will allow it on their land, and seek to make money from the disposal of waste water. So the company that has the monopoly on water supply and disposal in our region is exploiting fracking to generate shareholder profit from those activities, at the risk of compromising domestic supplies. I advocate, as responsible citizens, that we should avail ourselves of the facilities made available for recycling. I have a pedestrian permit for Salt Ayre Recycling Centre where items, for which there is no kerbside collection, eg light bulbs, drink cartons, can be recycled. Lancaster City Council is constantly reminding us to recycle. I recently made a request to the council for a recycling box for newspaper, cardboard, etc. I was disappointed to learn that they are only provided for a charge. This is a backward step as, I fear, some people will resort to using the grey bin for all their waste. Donald Trump’s visit to Europe left us all with much to worry about, including the fact that he and Putin between them control enough nuclear weapons to destroy our planet, and all life on it, many times over. This is first anniversary of publication of the text of the UN Treaty to Ban Nuclear Weapons which was agreed by the overwhelming majority of the world’s countries in July 2017 but which our government, like Putin and Trump, refuses to even discuss. In this context, Cumbria and Lancashire Campaign for Nuclear Disarmament (CND) will be holding a series of events on August 6 where we shall be asking people to call on the UK Government to sign the UN Treaty on the Prohibition of Nuclear Weapons and to commit to the process of nuclear disarmament. We will be at the Dock Museum car park in Barrow-in-Furness at 9.30am; at the Workers Statue, Dalton Road, Barrow between 10 and 11am; at Sellafield Main Gate at 12.45pm and at Wastwater between 2pm and 4pm. At Wastwater we shall be holding a Peace Picnic and a Ceremony of Remembrance of the A-bombing of Hiroshima and all suffering caused by nuclear arms. According to the recent special report in the Lancaster Guardian, crisis levels in mental health services are now unprecedented. Despite the best efforts of the NHS, Lancashire Police are overseeing individuals in crisis instead of qualified nursing staff. Under present conditions there appears to be little more that can be done without additional government funding. There are, however, some avenues of hope which save the NHS and police precious time and money. Advocacy Focus is a Lancashire-wide charity which provides information to adults on matters of mental health. It signposts distressed individuals and their families towards mental health provision before a crisis point is reached. It is also funded by Lancashire County Council to articulate the views and concerns of those who find themselves involved in the mental health system, a well-intentioned but complex public service. By providing these services, Advocacy Focus does not claim to eradicate the current problems of access to specialist help highlighted in the report. The NHS and police do a supremely admirable job on a day-to-day basis. But advocacy services provide a complementary service to the NHS working with those already involved, or at risk of involvement, in the mental health system. Together with the admirable efforts of police and the NHS, advocacy makes a real difference. Its value was also noted in the recent Independent Review of the Mental Health Act: Interim Report. Insofar as advocacy assists individuals before they reach crisis, its provision benefits everyone, not just the currently overstretched police and NHS services. This year 2018 marks the Centenary of the Armistice ending the First World War, and also the Centenary of the Royal Air Force. To mark the occasion I will be leading a coach party to visit France and Belgium to follow the events of 1918 on the battlefields between October 21 and 26. We will follow the German Spring advance and the Allied response and victory in the autumn. En route we will visit the Centenary exhibition at the Royal Air Force Museum in London to see original planes used in the war. We will visit the Armistice Railway Carriage in France and sites associated with the Red Baron Manfred von Richthofen and Mick Mannock VC, the Cumbrian padre T B Hardy VC DSO MC and the poet Wilfred Owen. We will also take part in the Menin Gate Ceremony in Ieper. There will be an opportunity to visit a relative’s grave or memorial by prior arrangement. We still have a few places left. If any readers would like more details I can be contacted on 01368 866826 or by email johndavidraw@:gmail.com and by post at the address below.